The Press box is themed "Filipino Pride" and contains four homegrown products. Except for the Camaru Naturals bamboo charcoal soap (whose new packaging got me so excited), I am unfamiliar with the rest of the brands. Among these products, I'm least excited to try out the lippie. I can't wait to test out the perfume though while the Pillow Mist intrigues me as it claims to "clear the mind" --- definitely not something you'll sleep in before a big exam, hehe. 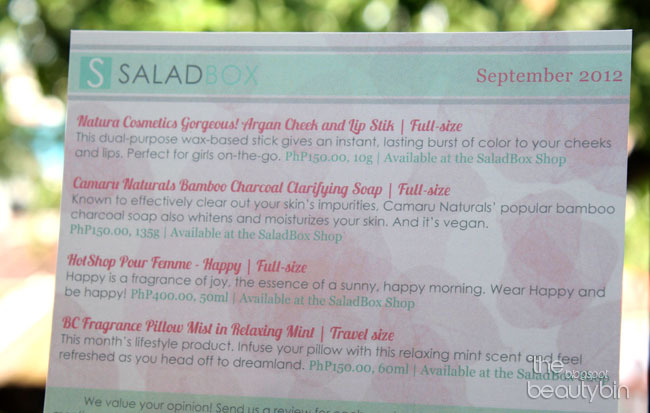 Check out my review of the products inside the September Saladbox. Is It Worth Subscribing To? At this point, it is unsound to come up with a conclusion. I was sent a Media edition of the beauty box which is in no way intended to mirror what paid ones contain. 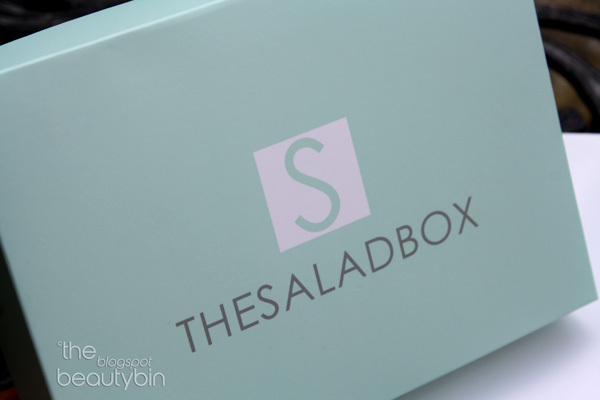 SaladBoxes are supposed to be a customized set of products based on the subscriber's beauty profile during sign-up. These are huge promises and getting all these for P500/month is a very good deal if you ask me. In all honesty, I feel that the SaladBox Press boxes may have been a less fruitful attempt in encouraging beauty enthusiasts to sign-up. Some conclude that the Press boxes ARE the actual boxes and so they shy away from hitting that 'Join Now' button. Again, Press Boxes ≠ Subscription Boxes. Did you subscribe for the September/October SaladBox? Do share with us what's inside your box when you get hold of it! I can verify that for you. I do know that the subscription will contain 4 or more products (at least 3 from beauty--skincare and makeup, and 1 lifestyle goodie). I will be waiting for posts on the real subbie box in the blogosphere and will do a post on that. I do not have a CC so I can't get a monthly recurring subscription. I did subscribed their 2 months plan/package. I just signed up this month and it says in my order status that it is still on the process. I'm too excited and I can't wait to see what's inside my Saladbox!! Thanks for giving your opinion on the box. I might have to do as you adviced, go for a monthly recurring plan and then cancel. We'll see how my first box fares before I go for the monthly beauty box. Drop me a note on what you think about Saladbox when your first box arrives!